Vocabulary development is a key component in upper-elementary reading programs. Students are usually given a list of important words from the reading material and asked to discuss their meanings and relationship to the story. 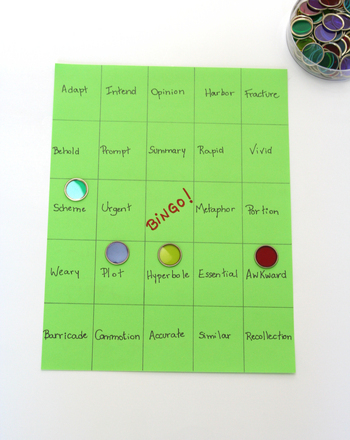 A fun and simple way to review these words and their meanings with your child is to play a kind of reverse bingo that features definitions as bingo cues. 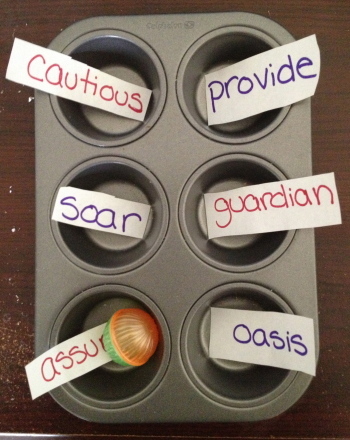 It’s an easy twist on the classic game and it will prepare your child for the vocabulary challenges that lie ahead! Create bingo cards by using the markers to draw 4 vertical lines and 4 horizontal lines to form 25 squares. Write “BINGO!” in the middle square. This middle square is a free space. Each player should fill in his bingo card with vocabulary words from the list. Once all cards are filled with words, begin calling out vocab clues. However, instead of the actual vocabulary words, call out the definitions. Players must then identify the word being described based on the definition given and find it on their cards. Continue playing until one player fills in 5 boxes down, across or diagonally and calls out “Bingo!”. Rotate and reuse cards to play several rounds. Note: Instead of bingo chips, players can use a pencil to mark boxes with a symbol, for example an “X” or a star. Choose a different symbol for each game. With this word play worksheet students will practise identifying words and phrases that have deeper meaning, such as oxymorons and puns.